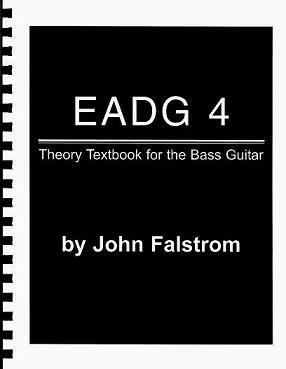 EADG 4 was written with the intention of teaching the bass guitarist what music theory is and how it works on the fretboard of the bass guitar. The approach in writing this book is unique in the fact that it does not include any musical notation, tablature, or diagrams. It uses finger patterns, charts, and definitions on how to play the bass. EADG 4 contains studies of the major scales, the natural, harmonic, and melodic minor scales, chord arpeggios, the modal system, harmonics, double stops, chordal studies, the standard 12 bar blues form, and much, much more. It is written with every type of bassist in mind - from the beginner to the advanced pro, from the "street" player to the "school" player. This book works for everyone. It is spiral bound with 236 pages. Contact us to calculate international shipping rates.